The most important thing for Lowe's today is to promote the 4th of July sale. We used EyeQuant's initial visual attention analysis to see which content is the most eye-catching (shown in red), and which content gets lost. Unfortunately, the elements that attract the most attention are the brand logo and the banner at the bottom of the screen, which will only be relevant for a sub-set of users because it's specifically about appliances. This could send mixed signals and not lead the users' eyes to where Lowe's wants them to go. 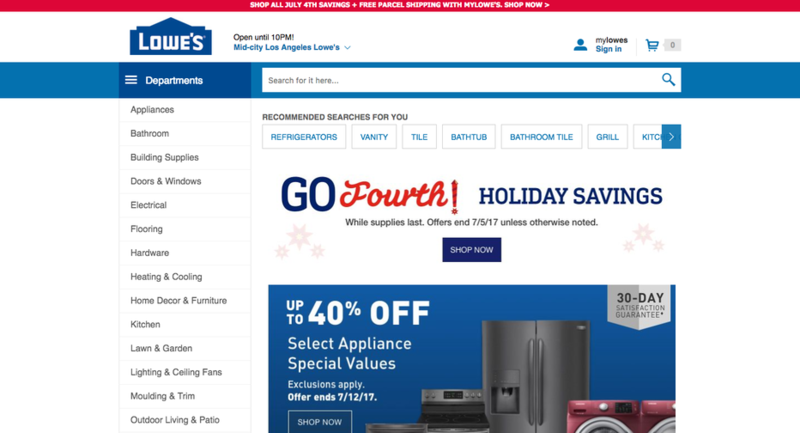 As with any eCommerce site, it's important for Lowe's to provide a clean, clear landing point for potential customers. In order to gauge whether or not Lowe's has accomplished this, we analyzed the page with EyeQuant's Visual Clarity algorithm, which rates the design on a scale from 0 (extremely cluttered) to 100 (extremely clear). The results are representative of a 200-user survey, where every participant rates the design in terms of clarity. Lowe's homepage scored a 57, which is above the average score for the Alexa 5000, but lags slightly behind Home Depot (59), and many of the other top retailers. For example, the National Retail Federation's top 50 eCommerce sites have an average clarity score of 64. It's clear that Lowe's could do a bit better in this regard. The easiest way to fix this is to just simply remove content that isn't absolutely necessary (prioritization is key here). This allows you to direct attention more easily (since less elements means less competition for attention) and reduce cognitive load for the user (the mental effort required to perform a given action). Remove any unnecessary text or features to reduce clutter. Change the top bar from red to blue so it's not competing for attention with the main promotional banner for the 4th of July sale. Redesign the CTA to maximize luminance contrast. These changes drive more attention towards the main CTA, and lead to a 35% higher clarity score (77). This gives the site a well-defined visual hierarchy and makes it crystal clear that the holiday promotion is the main offer on this page. Want to learn more about the insights EyeQuant provides?